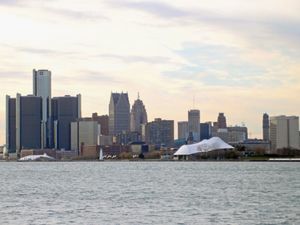 The East Side of Detroit is home to some of the city's most prominent attractions, such as Belle Isle, a large island home to a day's worth of attractions of its own, and historic Eastern Market, the largest market in the United States. Much of the Detroit International Riverfront is located in the East Side. Most of the attractions in the East Side tend to be near downtown or along riverfront. The rest of the area is mostly residential, but is also home to historic neighborhoods like Poletown and Black Bottom. The East Side is home to some of Detroit's most unique attractions. The Eastern Market is the largest public market district in the United States. Belle Isle is an island filled with many of its own attractions, such as the Dossin Great Lakes Museum, the Anna Scripps Whitecomb Conservatory, a beach, the Detroit Yacht Club, and even more than that. Belle Isle is the largest island park in the United States with 982 acres (3.9 km²; 2.42 sq mi). The island has several sites and attractions. It is the largest island in the Detroit River and offers good views of the city's skyline. It is open all year long and is home to the Detroit Yacht Club, the Detroit Boat Club, a Coast Guard post, and a municipal golf course. The city maintains a Nature Center where visitors are able to traverse wooded trails and view wildlife natural habitats. The island includes a half-mile (800 m) swimming beach. This page was last edited on 23 February 2018, at 17:49.